Textile Exhibition "Weaving Identity: Textile Richness in Latin America and the Caribbean"
On March 8, 2018, the Textile Exhibition "Weaving Identity: Textile Richness in Latin America and the Caribbean" was inuagurated at the National Handicrafts and Handlooms Museum in Delhi. 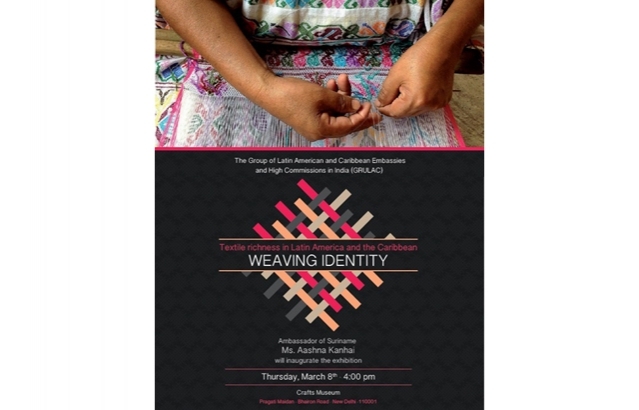 The inauguration of the exhibition was scheduled for 8 March 2018, within the framework of International Women's Day to pay tribute to the women of Latin America and the Caribbean and especially those women who created and retained much of the textile heritage that is displayed at the exhibition. The exhibition is opened to public till 8th April 2018with garments and textiles from Argentina, Brazil, Bolivia, Colombia, Costa Rica, Cuba, Ecuador, El Salvador, Guatemala, Mexico, Peru, Suriname and Uruguay.